Are you considering starting your own business? If so, you may find our New York LLC kit a worthwhile investment for just $34.95. It gives these instructions as well as sample operating agreements for single and multiple-member LLCs, an article on the pros and cons of operating as a limited liability company, samples of forms you will need to fill out, as well as directions on getting an EIN so your LLC can begin banking and tax transactions. Enter the name you desire into the search box, which is in the left hand margin and click Enter. Click on online applications in the left hand column. On the next page displayed under the subheading “State, Department of” you will find “Limited Liability Companies, Articles of Organization.” Click here. This will send you back to categorize the type of business you are in and then lead you through the application. That application asks for the same information we cover below regarding the download and print version of the application. Where the standard Articles of Organization document provides a space for it, specify the county in which the LLC offices are located. New York wants to know the name and contact information for a real person within the state of New York who the state can contact if it has questions or concerns about an LLC’s operation or if legal documents need to be served. Accordingly, enter your name and address information onto the lines that ask for this information. On the second page of the LLC articles of organization document, you need to provide your name and address as the LLC organizer. This information goes onto the last lines provided. New York State requires that the members of an LLC have a written operating agreement. Quoting from a Department of State document that describes this requirement, “The operating agreement is the primary document that establishes the rights, powers, duties, liabilities and obligations of the members between themselves and with respect to the LLC.” The state also requires that the operating agreement be entered into within 90 days of the filing of the articles of organization. Accordingly, you will need to have an attorney draft an operating agreement (which many people do) or you will need to buy or find a boilerplate operating agreement someplace else. Our do-it-yourself limited liability kit download comes with a free boilerplate LLC operating agreement, so it may be a worthwhile purchase for $34.95. An important caution about a haphazardly-adopted operating agreement: By honoring scrupulously the terms of an operating agreement, you typically increase the liability protection that the LLC affords members. And this is especially true in the case of one owner, or single member, LLCs. Better safe than sorry. 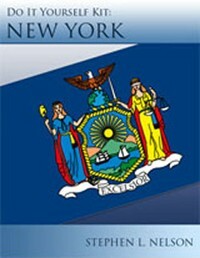 The New York Department of State welcomes questions regarding filing of documents. Direct the questions to one of their business specialists at (518) 473-2492. State law also requires a notice related to the formation of a limited liability company. The notice needs to be published in two newspapers designated as acceptable by the county clerk of the county in which the LLC is located (within 120 days after the effectiveness of the initial articles of organization). This means the county you listed in your Articles of Organization. The fee for filing the Certificate of Publication is $50. The New York Department of State welcomes questions, regarding filing of documents, at the above address or direct the questions to one of their business specialists at (518) 473-2492.